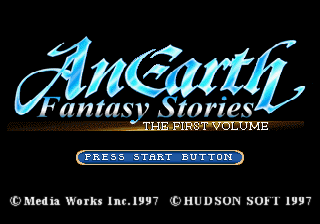 AnEarth Fantasy Stories: The First Volume (エイナスファンタジーストーリーズ ザ・ファーストボリューム) is an RPG for the Sega Saturn. It is based on an earlier PC Engine CD game by Hudson Soft. Main article: AnEarth Fantasy Stories: The First Volume/Magazine articles. README TXT 9,105 Messages from the developers.